TARTUS, Syria — Loyalists who support the government of President Bashar al-Assad are flocking to the Mediterranean port of Tartus, creating an overflowing boomtown far removed from the tangled, scorched rubble that now mars most Syrian cities. The port city of Tartus is sheltered by a mountain range. There are no shellings or air raids to interrupt the daily calm. Families pack the cafes lining the town’s seaside corniche, usually abandoned in December to the salty winter winds. The real estate market is brisk. A small Russian naval base provides at least the impression that salvation, if needed, is near. Many of the new residents are members of the Alawite minority, the same Shiite Muslim sect to which Mr. Assad belongs. The latest influx is fleeing from Damascus, people who have decided that summer villas, however chilly, are preferable to the looming battle for the capital. Should Damascus fall to the opposition, Tartus could become the heart of an attempt to create a different country. Some expect Mr. Assad and the security elite will try to survive the collapse by establishing a rump Alawite state along the coast, with Tartus as their new capital. There have been various signs of preparations. This month, the governor of Tartus Province announced that experts were studying how to develop a tiny local airfield, now used mostly by crop-dusters, into a full-fledged civilian airport “to boost transportation, business, travel and tourism,” as the official Syrian news agency, SANA, reported. The announcement coincided with the first attacks on the airport in Damascus, forcing it to close temporarily to international traffic. More important, security forces are continuously tightening an extensive ring of checkpoints around the potential borders of an Alawite canton. The mountain heartland of the Alawites rises steeply to the east of Tartus, separating it from much of Syria. Across the mountains, the Orontes River creates a rough line separating Alawite territory from central Syria. Rebel military commanders from adjoining Hama Province said government soldiers vigorously maintain checkpoints on routes leading up into the mountains. Mr. Hamwi and other rebel leaders said there were about 40 government checkpoints along more than 60 miles in Homs and Hama Provinces alone. Many Alawite commanders of Mr. Assad’s army have sent their families to their home villages, so they are particularly aggressive in protecting the area, said Hassan M. al-Saloom, a rebel battalion commander. They have formed committees to guard the outskirts of their villages, he said, and often negotiate local truces. “Nobody goes inside, and they don’t come out,” he said. There are widespread suspicions within the opposition that the military is shipping weapons into the Alawite hinterland, or has already positioned them. “The mountains and the coast make it hard to raid,” Mr. Saloom said. Castles left by the Crusaders dot the coastal range, a testament to its strategic value. 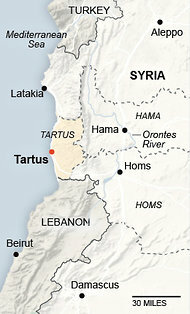 If Mr. Assad fled to Tartus, he could seek protection from the Russian naval base here, or flee aboard a Russian vessel. Russia announced Tuesday that it was sending a small flotilla toward Tartus, possibly to evacuate its citizens who live in Syria. But Tartus residents said that the Russian families from the naval base had already left, while the officers do not leave the base, which is little more than an enclosure near the civilian port. Opposition military commanders vow to block any attempt to create an Alawite state. “We want to prevent the regime from leaving Damascus at all, to ensure that when Damascus falls, the regime falls, too,” said a senior rebel military commander from Homs, who asked not to be named for security reasons. At a recent meeting of opposition military commanders in southern Turkey, none showed up from the meager forces around Tartus. The city experienced a few small antigovernment demonstrations after the revolution first started in March 2011, but none since. Abu Mohamed, 35, a real estate agent here, has tracked the fighting elsewhere in Syria by the license plates showing up outside his office. First they were from Homs, then Deir al-Zour, then Aleppo and now Damascus. He gets 20 to 30 calls a day, he said, from people looking for houses to buy or rent. Ahmed Jibril, a Palestinian commander still loyal to Mr. Assad, fled with his son to Tartus from Damascus after rebels there gained the upper hand in the Palestinian neighborhood of Yarmouk, activists said. Precise numbers are difficult to gauge. Azzam Dayoub, the head of the political office for the underground revolutionary council of Tartus, said there were at least 230,000 war refugees in the city. Others said the population of the entire province, once around 1.2 million, was now closer to two million. Most are Alawites, including countless government employees who have returned to their home province. But many are Sunnis, Christians or others close to the government who no longer felt safe elsewhere. Mr. Dayoub said Alawites in the town barred other minorities and members of Syria’s Sunni majority from entering their neighborhoods, and the two sides no longer frequent each other’s stores. The Sunni population has been collecting weapons to fight any future attempt to drive them out, he said. The large presence of non-Alawites along the coast prompted many residents to suggest that building an Alawite state would be impossible. Latakia, for example, a larger coastal city to the north with an international airport, would seem a more natural choice for a capital, but it is considered less safe for its large Alawite population because of repeated clashes there. But until the day of reckoning arrives, Tartus seems bent on blocking out the war raging over the horizon. An employee of The New York Times reported from Tartus, and Neil MacFarquhar from Antakya, Turkey. Hania Mourtada contributed reporting from Beirut, Lebanon, and Hala Droubi from Dubai, United Arab Emirates. Today in a show of defiance against Israel’s occupation and announced settlement expansion in the E1 area between East Jerusalem and the West Bank, 250 Palestinians erected tents near the village of Za’I’m and announced the establishment of a new Palestinian village named Bab al-Shams (Gate of the Sun). “We have set up 20 tents, and have enough equipment to stay here for a long time,” said PSCC spokesperson Abir Kopty (a frequent contributor to this site) to the Agence France-Presse. Following the construction, the Israeli military promptly ordered the villagers to evacuate the camp and delivered an eviction notice. The Israeli military then returned several hours later to issue a second set of eviction documents, according to Tweets from activists present on the groud. However, Israel’s High Court has already decided that the village cannot be evicted for the next six days, according to Bab al-Shams villagers. We, the sons and daughters of Palestine from all throughout the land, announce the establishment of Bab al-Shams Village (Gate of the Sun). We the people, without permits from the occupation, without permission from anyone, sit here today because this is our land and it is our right to inhabit it. A few months ago the Israeli government announced its intention to build about 4000 settlement housing units in the area Israel refers to as E1. E1 block is an area of about 13 square km that falls on confiscated Palestinian land East of Jerusalem between Ma’ale Adumim settlement, which lies on occupied West Bank Palestinian land, and Jerusalem. We will not remain silent as settlement expansion and confiscation of our land continues. Therefore we hereby establish the village of Bab al-Shams to proclaim our faith in direct action and popular resistance. We declare that the village will stand steadfast until the owners of this land will get their right to build on their land. The village’s name is taken from the novel, ‘Bab al-Shams,’ by Lebanese writer Elias Khoury. The book depicts the history of Palestine through a love story between a Palestinian man, Younis, and his wife Nahila. Younis leaves his wife to join the Palestinian resistance in Lebanon while Nahila remains steadfast in what remains of their village in the Galilee. Throughout the 1950s and 1960s, Younis smuggles through Lebanon and back to the Galilee to meet his wife in the ‘Bab Alshams’ cave, where she gives birth to their children. Younis returns to the resistance in Lebanon as his wife remains in Bab Al Shams. Bab al-Shams is the gate to our freedom and steadfastness. Bab al-Shams is our gate to Jerusalem. Bab al-Shams is the gate to our to our return. For decades, Israel has established facts on the ground as the International community remained silent in response to these violations. The time has come now to change the rules of the game, for us to establish facts on the ground – our own land. This action involving women and men from the north to the south is a form of popular resistance. In the coming days we will hold various discussion groups, educational and artistic presentations, as well as film screenings on the lands of this village. The residents of Bab al-Shams invite all the sons and daughters of our people to participate and join the village in supporting our resilience. A police contingency has blocked entry to the site, and there is still no decision on what is to be done with those already there. According to Abu Rahma, the project was started roughly a month ago, mainly by Palestinian residents of villages in danger of having their lands “frozen” to accommodate settlement expansions. The activists are from A-Tur, Isawiyah, Abu Dis, al-Eizariya, and Anata, among other places. Abu Rahma that the activists will reside at the location until their outpost is recognized. On Friday morning, 25 tents were erected for residents, as well as one to be used as a health clinic. Activists stated that they will hold daily events to discuss Israeli Prime Minister Benjamin Netanyahu’s settlement policies. Throughout the day Palestinian activists used social media to photograph and provide updates of the status of their new village and run-in with the Israeli Border Police. They also made a live-stream account where viewers can log in to watch in real time.